There is no Floyd Mayweather-Conor McGregor circus in 2018 to reel in the casual sports fan, leaving this Saturday’s rematch between Gennady “GGG” Golovkin and Saul “Canelo” Alvarez — who staged the second biggest boxing match of 2017, and the biggest between two actual pro boxers — as the premier boxing event on the calendar. The middleweight championship fight airs on HBO Pay-Per-View and takes place at the T-Mobile Arena in Las Vegas, but you don’t have to be in Nevada to bet it legally in the U.S. This is the first major boxing match of the post-PASPA era, and if you’re stationed in New Jersey, you can place a wager on it without getting out of bed. How much difference does a year make? 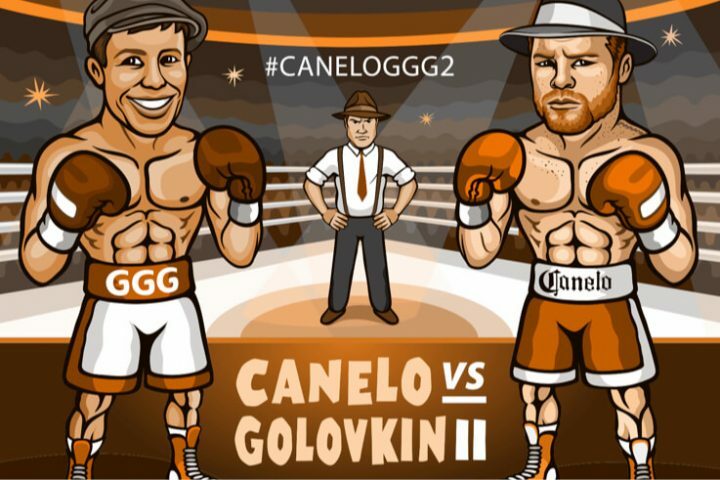 Golovkin and Alvarez fought to a controversial 12-round draw last September, an outstanding fight between top-10 pound-for-pound boxers that was spoiled by one atrocious scorecard. Judge Dave Moretti’s 115-113 (seven rounds to five) tally for Golovkin and judge Don Trella’s 114-114 (six rounds apiece) both made perfect sense. Adalaide Byrd’s 118-110 for Canelo (10-2 in rounds) was about as jarring as finding Mike Tyson’s tiger in your Vegas hotel room. Almost every bet was a loser in the first fight, thanks to the draw verdict. The only wagers offered at MGM that paid out were the draw (about 20/1), over 11.5 rounds, and the over on the number of rounds Alvarez would win on the scorecards (the line was set at 339.5 points) or the under on Golovkin’s total rounds (344.5). A lot has happened in the intervening 12 months. They signed for a May 5 rematch, but Alvarez failed a drug test and got hit with a six-month suspension. Golovkin kept the date and scored an easy two-round win over late sub Vanes Martirosyan. Then they hammered out terms for September 15, with the raw hatred between the fighters and their camps rising at every turn. The 28-year-old Canelo (49-1-2 with 34 KOs) is coming in skinnier this time, and there are whispers about whether he was all-natural last September and will be a different athlete this time around. He’s also been inactive for a full year. They’re both a year older, which is potentially bad news for the 36-year-old GGG (38-0-1 with 34 KOs). For all that has changed, the moneyline odds barely have. The numbers bounced around a little last time, but Alvarez was between a +130 and +150 underdog most of the way, and Golovkin was between a -140 and -160 favorite. At FanDuel Sportsbook online in New Jersey, Golovkin is -160, Alvarez +136, as of Wednesday afternoon. At Play Sugarhouse, GGG is -159, Canelo +132. In Vegas, the lines are similar. It’s been moving slightly in Canelo’s direction, thanks to bets like the $18,000 at Westgate plunked down on the Mexican superstar at +130 a couple of weeks ago. In what looks like a toss-up fight, at least when you consider that Alvarez has always received the benefit of the doubt from the judges in Las Vegas, it’s logical to put your money behind the guy who represents the better payout. You can also bet on either fighter by KO in any specific round at roulette-wheel-like odds, and you can group together rounds just about any way you want: pairs, sets of three, four, or six. Wanna have some fun? Bet GGG by KO in under 60 seconds on FanDuel at 150/1. Or bet that both fighters will get knocked down at +850 on FanDuel. Interestingly, neither FanDuel nor Sugarhouse offers the total-points-on-the-scorecard prop you can get in person in Vegas. FanDuel Sportsbook offers more options, and it varies from prop to prop which book offers the better odds. There are currently seven mobile sportsbooks in New Jersey; just by looking at two of them, you can see the wisdom in line shopping. Boxing can be a frustrating sport to bet, because you can get the in-ring action right and then have your winnings taken away by the ringside judges. Suffice to say Gennady Golovkin wasn’t the only fella in Las Vegas who was fuming over the decision last September. But there’s always a flip side. You can put a few bucks on a draw at 18/1 or more this Saturday night, root for a close, hard-fought, fun fight, and recoup the cost of the pay-per-view and then some if the judges offer a repeat of last year.